A serene seaside destination, Tarkarli lies in the heart of Malvan, part of the Konkan coast in western Maharashtra. Located at the convergence of the Karli river and the Arabian Sea, Tarkarli’s beautiful beaches stretch across the Sindhudurg district of Maharashtra that borders Goa. 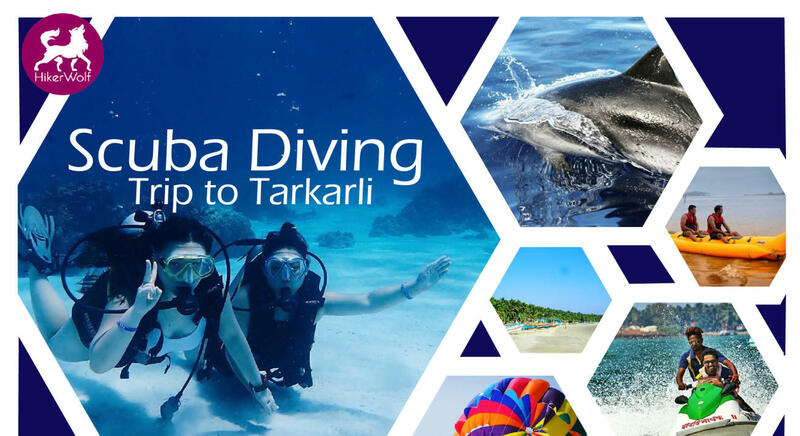 In just two days there is a lot this tour has to offer, you get to experience Scuba Diving, Dolphins, Banana Ride, Bumper Ride, Sleeping bumper ride, Jet Ski, Speed Boat Ride, Parasailing and more. All adventures are of easy to moderate difficulty level. These are experiences you must have at least once in your lifetime. Day 1 (Evening): The bus will depart from Mumbai around 8 pm. Trippers got to report at the meeting point 45 min before the departure time. Check in the morning and freshen up to have a delicious breakfast and leave for water sports. Water sports will include Banana Ride, Bumper Ride, Jet Ski, Speed Boat Ride and Parasailing on the beach. Lunch at the hotel. Later in the afternoon play beach games and enjoy our time to the fullest at Rock Garden. By evening we will be back to the hotel for Dinner and Spend the better half of the night playing games, Campfire, sharing stories, singing songs and have long conversations. Day 3: The D day, Scuba diving! Sightseeing, evening at the beach and departure for Mumbai! Early morning, we leave for scuba diving, 15 mins boat journey from the seashore. An instructor will provide basic training before entering the vibrant underwater world teeming with marine life. Swim alongside placid turtles, curious schools of colorful fish and the occasional wary shark as you explore Tarkarli’s thriving coral reefs. The trilling dive will last for half an hour. After the dive we will collect the underwater photo and video shooting, which I know, you will not wait to share on all your social media handles. Then we shall return to the hotel and have lunch. Post lunch, we shall move to the Sindhudurg fort to witness the adorable sunset. Also, have some fun at the beach. Post dinner we shall start our journey back to Mumbai. Day 4: We reach Mumbai back in the morning with a lot of pictures, memories, and experience for the lifetime!